Mix-a-Monster Challenge: Create a Monster in Meshmixer and enter to win a Free Multicolor Gloss Print Plus a Premium 123D License! Release the monster inside you! 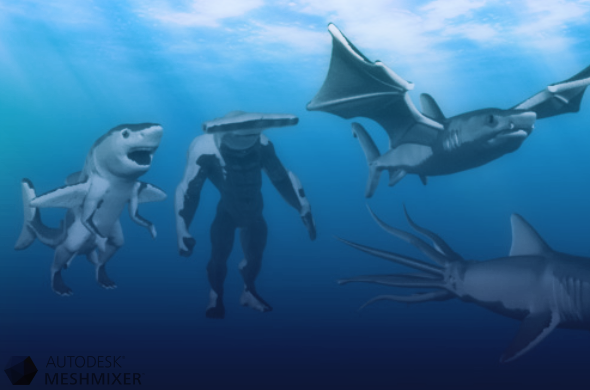 Use Autodesk’s free Meshmixer software to create and combine designs until you have a splendid new creature or crossbreed ready to show the world. What is your monster like? Is it cute? Scary? Shy? Menacing? Show us! Upload your designs on our Challenge Page. Winners of the Mix-a-Monster challenge will receive a free multicolor gloss 3D print of their monster and a free Autodesk 123D Premium license. Challenge ends on October 29, 2014! Read on for rules, special hints, and details. This is what Piggy, our Pinguine, looked like as we sculpted him on Meshmixer. 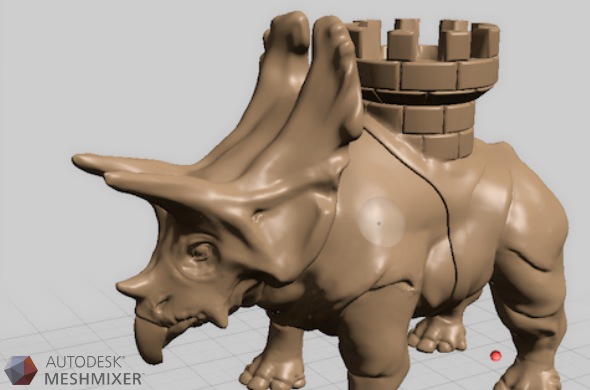 Meshmixer is a 3D sculpting-based CAD (Computer Assisted Design) program created by AutoCAD as part of their free 123D software lineup. 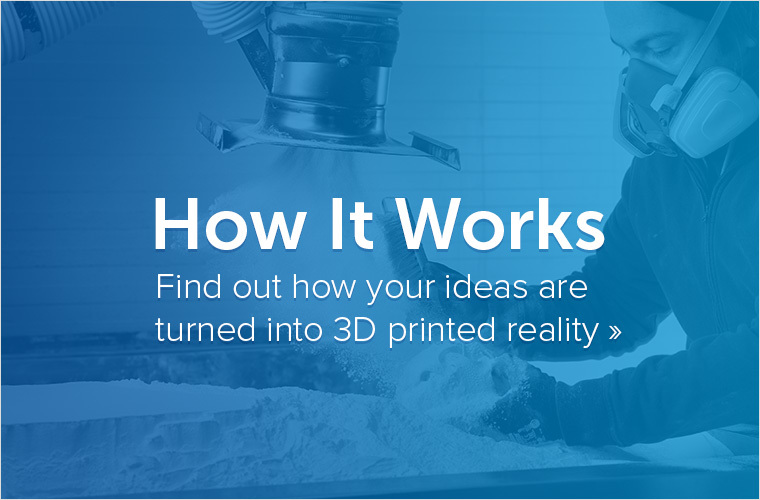 It is intuitive to use, so no previous 3D design experience is necessary to operate it. This software can be used to intuitively sculpt designs, hollow them out, cut them apart, and combine parts together. 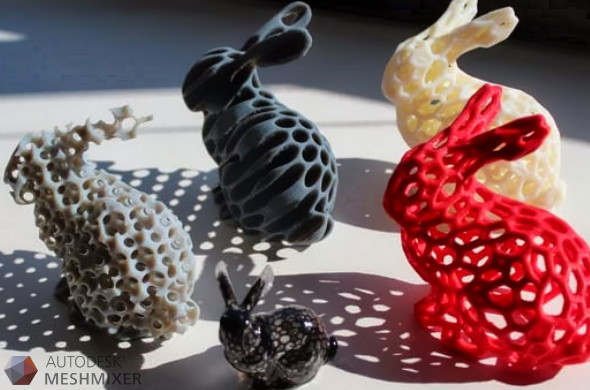 Meshmixer avoids wrecking your mesh’s internal or external geometry, so you can create a fully printable design from this software alone. You can also prepare (i.e. 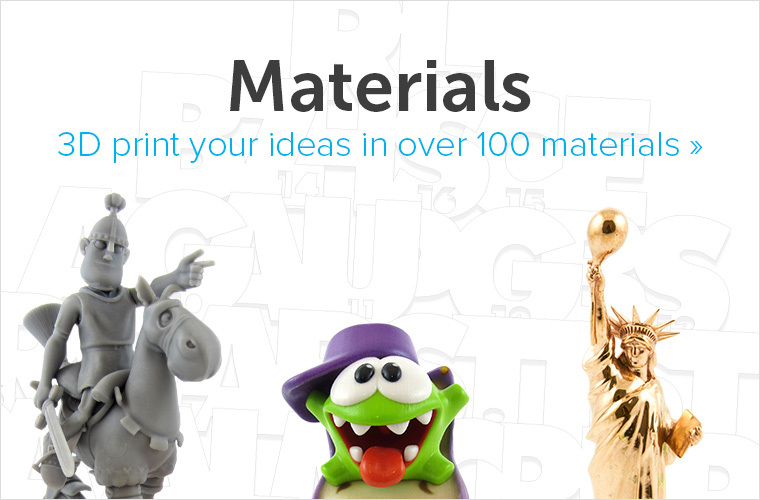 slice), orientate, and submit your files for printing on most 3D printers. Winners of the Mix-a-Monster contest receive a free Multicolor Gloss print of their design, along with an Autodesk 123D Premium license. Your design must be printable in our Multicolor material. 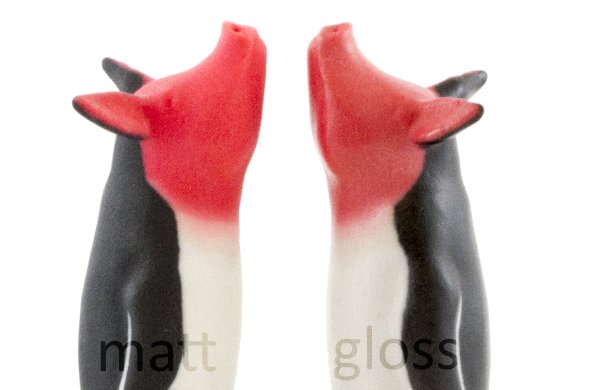 See the design guide here. Your creation should be able fit in a box with the maximum volume of 250cm3( x * y * z < 250cm3.) For example: 50x50x100mm. You can check this size with the Units/dimensions tool in the “Analysis” menu of Meshmixer. The model or material volume should be less than 60 cm3. This can be verified in “Stability,” another one of Meshmixer’s “Analysis” tools. Don’t forget to include a Meshmixer screenshot with your entry! 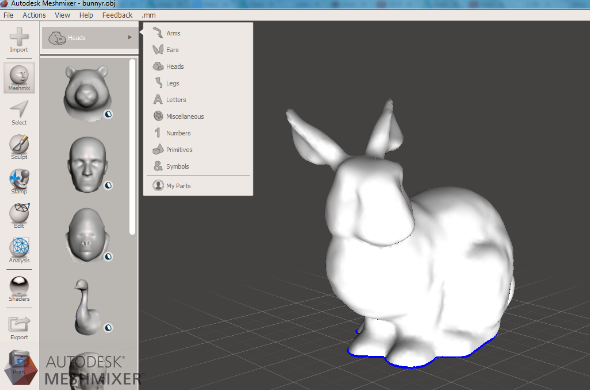 A screenshot of your design in Meshmixer. Entries without screenshot are automatically disqualified. 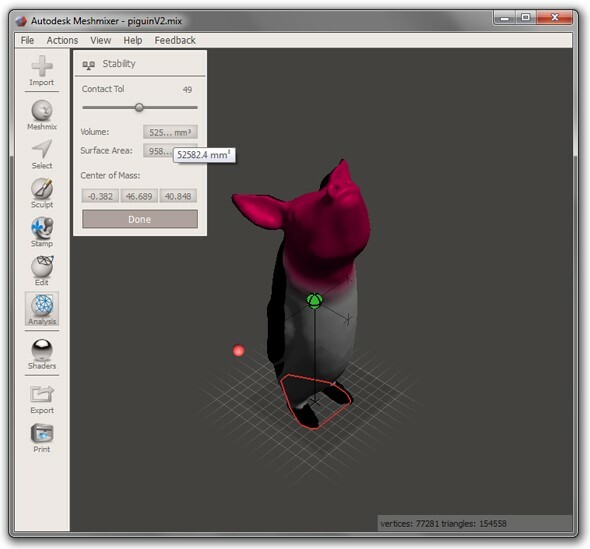 You can hollow and prepare your file for 3D printing from inside Meshmixer. No need for a second program. 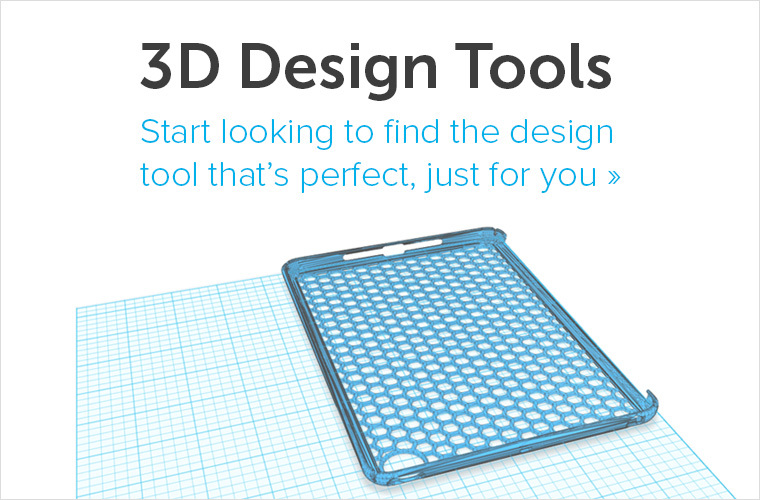 One Autodesk 123D Premium Membership. All participants will get 10% discount when printing their design. Submissions will be accepted up until 23:59 Central European Time, October 29, 2014. Jesse Harrington Au, Maker Advocate-Autodesk Inc.
Be sure to include a quality render, or “preview image,” of your 3D design. Judges rely on renders during the internal voting process. i.materialise reserves the right to amend these rules at any time. Any amendment to competition rules will be posted on the i.materialise website. To upload your designs, go to our Challenge Page, scroll down to the bottom, and click the “Submit Design” button. Which monster will you make?